The data, from 4C Insights, indicates that Ireland may have won the rugby but it seems England fans are the most supportive with only a 7% drop in social sentiment from the competition, despite the loss. Despite claiming the Grand Slam on Saturday, Ireland Rugby sentiment also dropped, by 3%, over the course of the competition. This could suggest Irish supporters may have struggled to cut through the noise generated around the final game, despite it being their day. •	Wales saw the biggest decrease in sentiment, of 25%. This highlights that rugby fans were not impressed with their performance this year. Insights also on the kit sponsors for the teams are below, highlighting that passive eyeballing advertising on the kits still resonates with viewers. 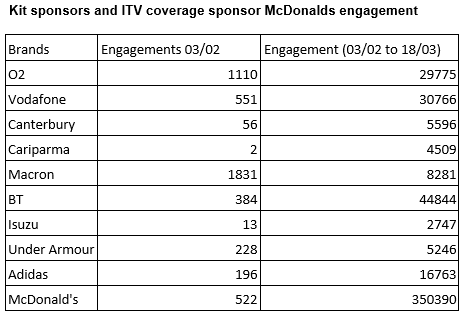 This also converts into social engagement showing that kit sponsorship is still valuable to the brands.